Pest Control services you can count on! Our Expert Technicians will rid your home or business from animals such as raccoons, squirrels, bats and skunks. We also help control and exterminate mice, rats, wasps, ants, spiders, cockroaches and more! You've got insect or rodent problems - we get rid of them all. GET MY QUOTE NOW! Why Halton Wildlife & Pest Control Services? Trust a wildlife removal services company that is locally owned and operated. We also live in the area in which we provide animal and pest control services. We care about our Halton and area neighbours! We're minutes away from you whether you're in Burlington, Oakville, Milton, Hamilton-Waterdown or Mississauga. We know the neighbourhoods well and come ready to do the job right. Only qualified, experienced wildlife removal technicians are charged with providing animal control services to you. Also, when it comes to pest control extermination, only a licensed professional will apply treatment. Our pros will take the time to answer any of your questions. Whether it be when we visit to provide your estimate or during/after the work being done for you. We efficiently take care of nuisance animals and pest issues because we want you to go back to enjoying your home and/or eliminating disruption to your business. We quickly address your pest problems because we're always local and we know how to take care of nearly all nuisance animal, rodent, or insect issues you might have. 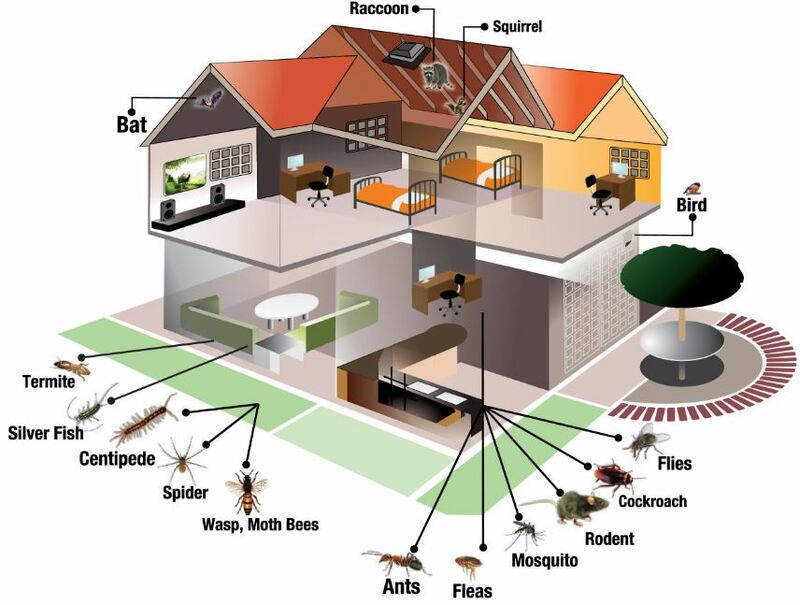 Whether it be wildlife (raccoons, squirrels, bats, skunks, opossum, birds), rodents (mice or rats) or insects (spiders, silverfish, ants) or even wasps - we have pest control technicians standing by. We've seen it all and taken care of all common pest problems. We're not satisfied until you are. We know that if you're calling us for a pest problem, you're probably anxious and wanting it addressed immediately. We're respectful of your home and property and take care to explain how we'll take care of the problem. Beyond getting rid of animals, we're also concerned with ensuring there's no damage to your home that may cause you bigger problems later, and we'll offer decontamination/clean-up to restore your property to a clean, safe state. We complete animal and pest issues right every time, which makes it easy for us to guarantee our work. Wild animals such as squirrels, raccoons, or birds won't be able to re-enter treated areas and we'll help pinpoint vulnerable entry points for you too. Should there be an issue after the work is completed, we're just a phone call away! Wild Animal & Pest Control Services You Can Count On! Our Expert Technicians will rid your home or business from wild animals plus pests such as mice, rats, wasps,ants, spiders, cockroaches and more. Residential Pest Control - From mice to wasps to ant problems. Find out more about our residential pest extermination and control services. Yes, they're child friendly! Commercial Pest Control - Having a pest free environment for your business is crucial from a health and safety perspective, never-mind employee and customer comfort. Learn more about our commercial abatement and extermination services. Whether you've nuisance animals in your attic, under your deck, in the garage or shed - call the experts today! Thanks Halton Wildlife for the quick reponse and service - the raccoons are gone and have not been able to get back into the attic - fantastic work! Ryan was great. He took his time to try and figure out where the squirrels were getting in before giving me a removal quote (unlike the other guys). I saw Halton Wildlife was local and owner operated so I called and glad I did. They're professional and quick - got rid of the skunk problem in no time. I'm petrified of wasps! In less than an hour, the wasp net and my fear was gone. Thank you Halton Wildlife! Not only did they get rid of the ants in my home, they provided me tips on how to prevent them from coming back. Need Professional Pest Removal Services? Join satisfied customers across Burlington, Oakville, Milton, Waterdown and beyond! From raccoon removal to skunks, squirrels, wasps and ants...we have you covered.